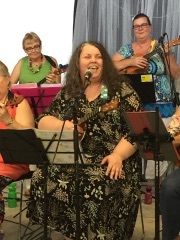 Currently Steph teaches Willin Wimmin, in Williamstown, Wyndukes and Ukulele technique classes in Werribee and teaches Beginner Choir and Beginner Singing classes at Centre for Adult Education in Melbourne. Steph believes everyone can and should sing! There is no better place to work on your voice than in a choir. singing harmonies that are a joy to be a part of. Steph has been a musician for 20 years. She is a singer and ukulele player, a choir director, singing and ukulele teacher and she is one third of gorgeous folk trio, Paisley & Plaid. Old Shire Offices. Room 4. Website by Steph Payne 2016. Unstrung Music. Singing and Ukulele Lessons.